It was kind of a weird, stormy weather kind of evening. Really humid and it seemed thunderstorms were on their way. Caroline kept remarking about how dark the skies were but then while it got windy and rained a little, it never actually stormed. When we were leaving Sam's Club the sun was out and it was raining. So as we were driving, I looked for a rainbow thinking I probably wouldn't see one. At first I had my sunglasses on and I saw the faintest one that I couldn't see without them. But by the time we were almost home it was finally bright enough that the kids could see it. It almost looked like it was coming from our house as we approached our development. And the coolest thing was, you could see it was an actually rainbow and not just a segment of one - you could see the entire arc on both sides - VERY cool. So we got home and had to take some pictures. 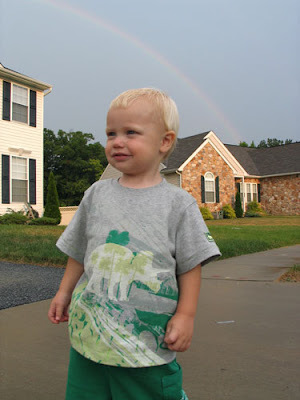 Of course they were both more intersted in trying to run in the wet grass or out into the street, but I did manage to get a cute one of Bryce with the rainbow in the background. I like how it arcs over my house - kind of idyllic, huh? I'm still amazed by rainbows - they just seem magical to me. How those amazing colors can be in the sky - just fascinates me. I saw a rainbow too - prob the same one as you. 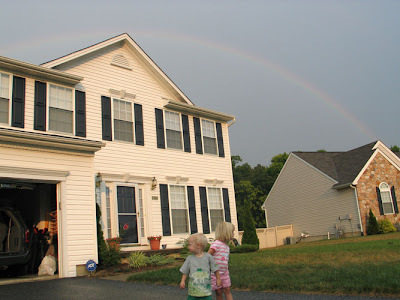 We were getting ready to get on to 43 towards White Marsh from RT 40 (we had just been shopping at Costco) and I saw a rather large rainbow looking quite like the one in your pic, in the sky towards the Essex/Middle River area. Neat, huh?